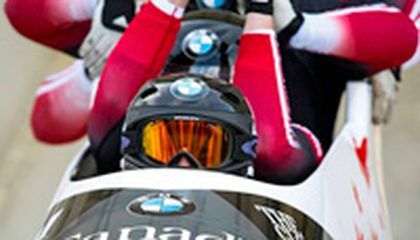 Elana Meyers Taylor of the United States and Kaillie Humphries of Canada have become the first women to race in a four-person bobsled event in the World Cup. The race was held in Calgary, Canada. Humphries finished 15th with a two-run time of 1 minute, 48.87 seconds, and Meyers Taylor, from Douglasville, Georgia, was 16th out of the 17 finishers in 1:49.52. In the fall, the International Bobsled and Skeleton Federation declared the four-person sled race as gender neutral so men and women could compete against each other. "Everyone was so excited to see us race today and it really helped me realize the significance of the moment," Meyers Taylor said. "There were some little girls at the track that were excited to watch women's bobsled today, and hopefully what Kaillie and I are doing inspires them. "I hope someday a woman racing in four-man isn't news (and) I'm willing to do anything it takes to advance our sport, even if it means racing twice in a day." Meyers Taylor teamed with Justin Greenwood of Palmyra, Virginia; Carlo Valdes of Newport Beach, California; and Adrian Adams of Reidsville, North Carolina, in the Classroom Champions sled. Humphries teamed with Dan Dale, D.J. McLelland and Joey Nemet. "(Elana) and I really want to try and get more women driving the four-man and eventually have women's four-man as its own event, so the women can have two events, two and four, and so can the men," Humphries said. "In the meantime, this kind of bridges the gap a little bit." Meyers Taylor and Humphries are the first women to race with the men since the World Cup bobsled circuit was created in 1984, but they aren't the first to compete with the men. Katharin Dewey was a pioneer of women's bobsledding and piloted her team to a historic victory in the 1940 U.S. Championships when mixed teams were allowed. Women were later banned. Earlier, Meyers Taylor teamed with Cherrelle Garrett of Hayward, California, to win the women's race, finishing in 1:51.7. They also won the week before in the season-opening event in Lake Placid, New York. "It definitely feels good to get another win, especially when it's not on home ice," Meyers Taylor said. "It's a big testament to how hard Cherrelle has worked this season, and we're really starting to gel and click. Our push times give me the ability to make some mistakes down the track, so I have her to thank for this win." Critical thinking challenge: When will woman racing in four-man bobsled no longer be newsworthy? What could have been saved in stone 200 years ago? woman racing in four-man bobsled no longer be newsworthy when Everyone was so excited to see us race and it really help her realize the significance of the moment. 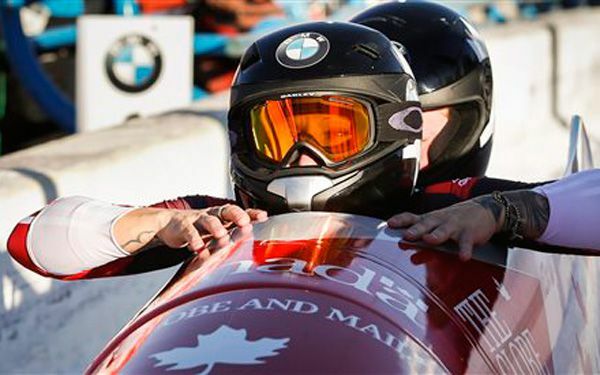 It will no longer be newsworthy with a woman racing in four-man bobsled when they accept women in the same things as men and don't make us have to work so hard just to get us accepted. So when little children hear about this, they would want to join the same things that men are mainly accepted in and change it around so it wont be that surprising. This article is about two women who raced bobsleds in the Olympics. When they placed and finished with the men it brought some attention to the rules of women bobsledding. They got rid of the all mens rules and they continued there goal of making women's bobsledding there own event in the Olympics. I thought this article was persuading telling an inspiring story of two women trying to get there goals. when they accept women in the same things as men. We feel like they don't make us have to work so hard just to get us accepted.Whenever little children hear about this they would want to join same things that men are mainly accepted in and change it around so it wont be that surprising. Woman racing in a four-man bobsled won't be in the news very long. To be honest no one will really care in so places, and others will be very excited about it. I think its pretty cool that a girl can compete in a sport that is a guy sport. If you beat a guy in his own sport that he loves that would make me feel awesome! I would love to beat a guy in his own sport that he loves. I think that what these women are doing is very inspirational. Women should be allowed to participate in the same sports as men and it shouldn't be an uncommon thing. People should just accept that women can do the same activities as men.